The theory of the Big Bang, as modified by the inclusion of dark matter, cosmic inflation and dark energy, is still the best explanation we have for the origin of the universe. However, there are still gaps and inconsistencies in our knowledge, and perhaps the nagging suspicion that the more we learn and the more questions we answer, the more there is to learn and the more new questions arise. Since the 1980s, steps have been taken towards a “quantum theory of gravity”, such as the theory of superstrings mentioned in the previous section, steps which many physicists believe are necessary before we can advance any further in our understanding of the universe. However, the mathematics involved is hugely complicated, the tiny scale is inherently unobservable, and it is difficult to tell just how much progress is actually being made, and how much of the enthusiasm being shown is merely due to the elegance and the compelling apparent “rightness” of the theory. It is apparent, though, that the laws of physics and the fundamental forces that have led to the creation of the universe as we know it (with all the complexity of stars and galaxies, a complex and interactive periodic table of elements, intelligent life, etc), are extremely sensitive to any change. For example, even a relatively slight difference in the ratio of the strength of the strong force holding atoms together to the force of gravity (about 1038) would result in a much shorter or longer life for stars and much less favorable conditions for complex evolution, quickly leading to a featureless, sterile universe. If the very small mass difference between neutrons and protons (about one part in a thousand) were changed by only a factor of two, then the abundance of elements in the universe would be radically different from that observed today. For some, the extent of these apparent coincidences and "fine tuning" have led them to attribute it to the hand of God and so-called “intelligent design”. Others have invoked the “anthropic principle” that this universe appears to be fine-tuned for life, specifically human life, and therefore could not be any other way (if it were, they would not be here to observe it). As for the oft-posed question of what was there before the Big Bang - why there is Something rather than Nothing - physics as it stands has no answer, and such a question is considered effectively meaningless by most physicists. If matter, space and time all came into being with the singularity we call the Big Bang, then so did the concerns of physics, they argue, and any discussion of what came before is therefore an exercise in metaphysics and philosophy, not physics. If pressed, most scientists would probably have to answer: “As far as we know, nothing”. New work on eleven dimensional superstring theory and M-theory, though, is suggesting plausible answers to even this audacious question. 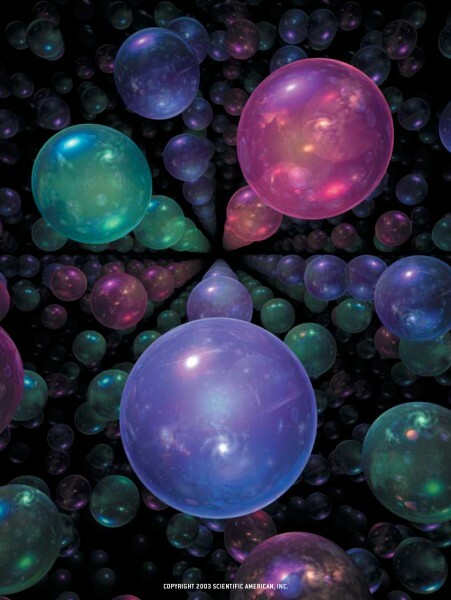 Among other ideas, it is hypothesized that the universe that we inhabit is just one of a potentially infinite number of parallel universes (the “multiverse”), some of which may have the same physical laws and fundamental forces but fine-tuned slightly differently, and some of which may have an entirely different set of laws and forces. What we think of as the Big Bang was just one of many collisions between rippling membranes in the eleventh dimension, and merely the result of two parallel universes momentarily coming together. Others, like the Ukraine-born American physicist Alexander Vilenkin, claim that such extravagant theories are not needed to explain how Something came out of Nothing, and that quantum theory, and more specifically the concept of quantum tunneling and the virtual particles that pop into existence apparently out of nothing as a result of the uncertainty principle (see the sections on Quantum Theory and the Uncertainty Principle for more details), are quite sufficient to explain how the universe first came into being.